Perfect Beach House with Pool! - Renovated & Decorated! 7BR, 4 Bath, beautiful new pool - Sleeps 24 Comfortably - Beach Close! This home is bright, airy and spacious, making it perfect for large groups. It is beautifully decorated in coastal colors and includes all the items you could possibly need to have a fantastic beach vacation. The main floor great room is a living, dining, kitchen combination and is huge! Its furnishings are not only attractive but comfortable and provide the perfect place to gather and watch TV, play games, or create and enjoy a fantastic meal. The kitchen can easily accommodate more than one cook and is fully equipped. Open the double glass sliding doors in this area and enjoy the ocean breeze, or walk out on the spacious deck to relax. If quiet relaxation isn’t your mood you can go downstairs and enjoy the private pool, picnic, and play area. Here you will find both sun and shade areas and even a grass area with a hammock. This home has something for everyone in your group to enjoy! The home has three distinct sleeping zones to perfectly house multiple families vacationing together and is perfect for children. Zone 1 consist of three large bedrooms which share two bathrooms. In Zone 1 two of the rooms are furnished with a queen bed and two twin bunk beds in order to sleep a group of four, the 3rd bedroom has one queen bed to comfortably sleep two. Zone 2 consist of two bedrooms, of which 1 is the Master bedroom, and the other is a double queen and shares a bathroom. Zone 3 is downstairs and consist of 1 bedroom with king bed and a bunk room with double queen bunk beds (sleeps 8!) which share a bathroom. Overall we have 8 Queen Beds, 2 King Beds, and 2 sets of built in custom twin Bunk-beds. All beds are pillow top mattresses so everyone is your group will find the perfect place to cuddle in after a long day in the sun! 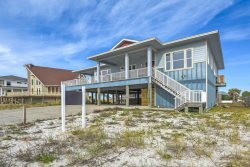 You’ve found the perfect Beach House for that well deserved Gulf Coast Beach getaway located on Santa Rosa Island, Pensacola Beach. Pack up your family and friends and come enjoy our area. Surf, sand and sun, along with shops and restaurants all within minutes of this fabulous house. Make your reservation now for an unforgettable island experience! Beautiful house, perfect location and super friendly text messages with the staff. The team was very responsive to our needs when called. We found one room that didn't have a TV. The service team told us why and offered a DVD and monitor. On day 2 the toilets in the King size bedrooms decided to run continuously. I reported the issue and a service agent came out to replace the flapper on both toilets. These were minor things that didn't hamper our family time together. We were a little concerned about the pending Tropical storm Alberto that skirted the area while we were there. No one bailed out and all who came were glad they made the journey. The service team responded to our needs which were minimal. This was our second time renting a beach house for the family get together and it allowed us to see a different type/style of property. Overall, everyone enjoyed the house! I can't wait to start planning for next year's trip. Any suggestions would be welcomed. We truly enjoyed our stay. Although we were there was an unfortunate reason, we made many wonderful memories with our family while staying at your property.